Please be aware that from 8 October 2018 our phone lines will be unavailable between 12:45-13:45. You will still be able to come into the surgery as normal. During the Easter weekend we will be closed from 18:00 on Thursday 18 April 2019 to 08:30 on Tuesday 23 April 2019. You may be able to get medical help from a pharmacist. You can find pharmacy opening times for the Easter weekend here. Alternatively call 111 or, if it is life threatening then call 999. Patients registered with the majority of GPs in Crawley (including Ifield Medical Practice) can now access evening and weekend GP appointments. Patients can book evening and weekend appointments at a primary care hub in town. The service was designed by NHS Crawley CCG, working in partnership with local patients and clinicians. The hubs are run by Alliance for Better Care Ltd, the local GP Federation. We are very pleased to announce that we have been recognised for the work that we do in supporting apprenticeships at the recent Kent Surrey and Sussex Apprentice and Support Workers Awards 2018. We were one of only two surgeries at the awards ceremony, all the other attendees being the big hospital trusts with whole departments working towards supporting apprentices. 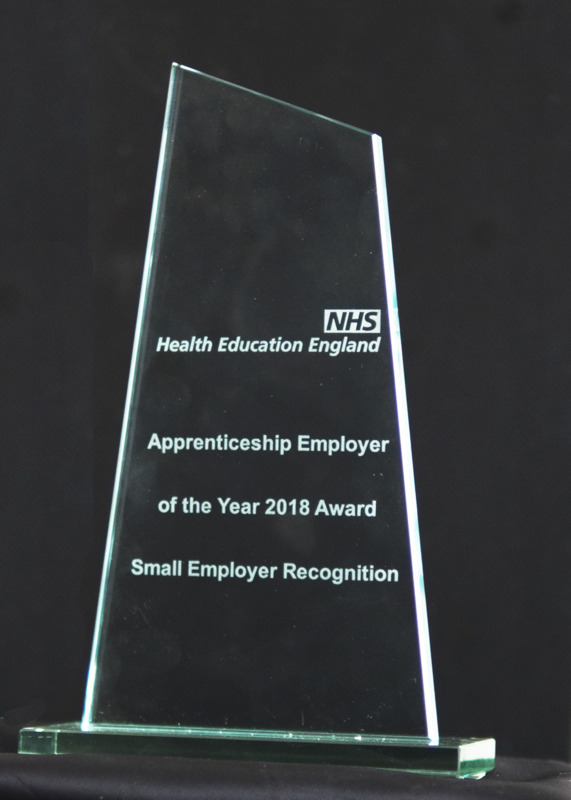 However Health Education England were so impressed with the work that we are doing to support and develop our apprentices, they created a special category especially to recognise small employers. The awards have been going for four years, but this is the first time that they have felt the need to recognise small employers! You can now refer yourself to physiotherapy without seeing your GP first. If you would like your condition to be assessed please complete the online referral form at the link below or pick up a paper form from our reception team. All patients now have a named allocated GP, this does not affect your choice of clinician when you request an appointment. If you wish to know who your allocated GP is, please contact us. The Ifield Medical practice is a group of six doctors - three female and three male - working as a general partnership known as Ifield Medical practice. The partnership cares for around 10,000 patients. The practice has been approved for GP and medical student training. Each year one or more fully qualified doctors with experience in hospital medicine may spend time with the practice as part of their preparation to become general practitioners. They share all aspects of patient care and the partners welcome their contribution to the team. Occasionally, medical students, district nurses in training and student community midwives may also spend time with the practice. If you are unwell out of hours, please Choose Well and choose the most appropriate service. Online access to your medical record is now available , as well as the ability to book/cancel appointments and order repeat medication online. These services are available for all patients over the age of 16. If you wish to take advantage of this service, please read the information leaflet and complete the registration form below and bring it into reception with some photo id. We will require photo id for all online access going forward.